Onkyo has built up an excellent reputation for its AV receivers. And here we have the HT-S3305 which is intended to leverage this accumulated experience: a budget yet full-blown AVR, packaged with a matching 5.1 sub-sat speaker set. Generous connections include a choice of three HDMI v1.4 inputs, in addition to provision for analogue composite and component sources. There's no conversion from analogue video to HDMI, so you may have to route appropriate cabling to your display. Nor are there front-panel or 5.1 analogue inputs. You are, however, blessed with an analogue audio-only input, plus three digital audio inputs, two of which are optical. Most 'all-in-one' systems today make provision for the ubiquitous iPod. This one doesn't, instead offering a universal port of the type you'll find on Onkyo's 'standard' AV receivers. Into this, you can plug in an optional iPod dock or DAB tuner. As an AVR, the speaker connections are fairly standard, compared to what you'll find on the rear of an all-in-one system. Binding post terminals are provided for the fronts, while the surround speakers are connected via spring clips. Another set of such terminals accommodate a second set of front speakers, possibly in a second room for basic Zone 2 functions. The only downside is that the main unit (the HT-R380) is designed for use with a passive subwoofer – in other words, the amp is built into the receiver, rather than the sub itself. This need not be a problem; some subs can be driven at speaker-level, although the fact the HT-R380 is already delivering a LFE signal could be problematic (another possible solution would be to drive an active sub's line input via a resistive attenuator). Thankfully, crossover frequency can be adjusted from 40Hz to 200Hz in the menus. The satellite speakers all employ a single magnetically-shielded 3.15in drive unit, as opposed to the separate crossover-linked tweeter and woofer of more upmarket sub-sat packages. The bundled bass-reflex subwoofer, meanwhile, contains a 6.3in driver mounted in a down-firing position. All connecting cables are supplied. Just like the average AVR, the HT-R380 caters for a wide variety of audio codecs and surround formats. There's also a selection of 11 DSP variants, including modes optimised for gaming. The HDMI ports support CEC device control and, with this engaged, I could adjust the receiver's volume with our Samsung TV's remote; however, Onkyo's remote would not operate my Samsung Blu-ray player or TV. Changing AV input on the TV would also change input on the receiver– a source of annoyance if, for example, the TV is switched to its PC input when you're listening to a CD through the Onkyo rig. An HDMI passthrough function automatically routes the last-used source to the TV when the receiver is left in standby. 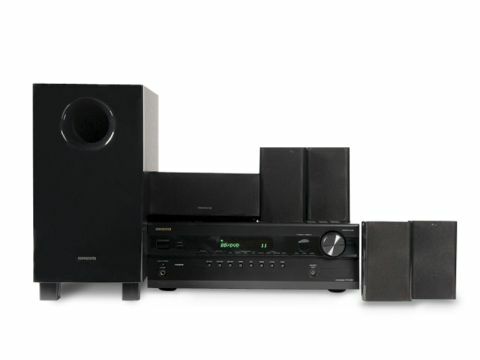 In performance terms, Onkyo's HT-S3305 system punches way beyond its weight. It does far more justice to Blu-ray (and even DVD) than the average all-in-one system, with balanced and involving sonics that don't run out of steam in an average sized room, especially in the all-important LFE department. Considering the single drive units of the satellites, a surprising degree of treble detail is conveyed, too. Versus a full-blown separates system, though, there are limitations. When driven hard, presentation nudges towards the aggressive, and while the centre channel performs very well overall – dialogue is always intelligible – some bassier vocals suffer from a minor 'plummy' colouration. That'a a minor gripe, though, and this system still comes highly recommended for those on a tight budget.